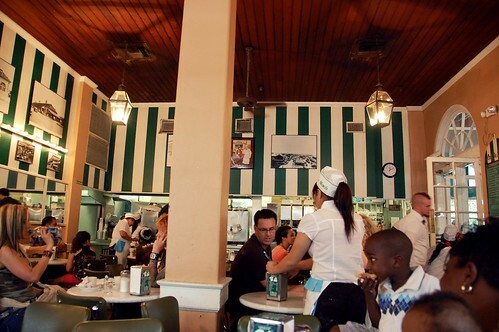 Many people believe that no trip to New Orleans is complete without a visit to Cafe Du Monde. Count me as one of those people now. The line snaked far onto the sidewalk. We walked to the front of the line, however, and discovered that all of these idiots were clamoring to sit on the outside patio. There was no wait whatsoever for the ample indoor air-conditioned seating. Really, people? You want to stand under the beating rays of the sun to eat deep-fried dough and drink scalding hot coffee in 95% humidity? We sat down immediately inside -- comfortable and cool! You can't see too well in this photo, but this kid had powdered sugar everywhere. It was awesome. We had a good laugh about it with his mother. And then our beautiful mountain of beignets appeared. One order consists of three glorious golden God-sent beignets -- crunchy, sweet, doughy little pockets of piping hot perfection. We got two orders and washed them down with iced cafe au lait. I'm pretty sure I looked just like the snow-dusted kid by the time I was done. I wish I could start every day like this. Next: Strolling around the Quarter. 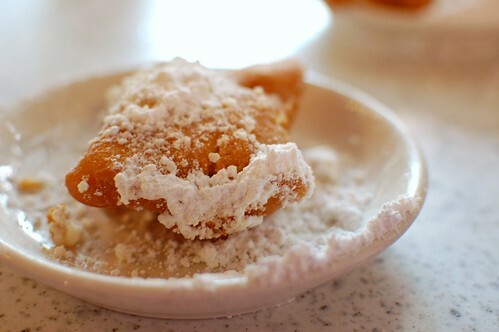 Beignets are quite possibly the most delicious treat in the world. They are amazing at the imitation Jazz Kitchen in Downtown Disney, so I can only imagine how scrumptious they were in NO. Jealous! Oh my. I'd forgotten how busy it gets over there... What time did you arrive? that line is ridiculous and that kid is too funny! 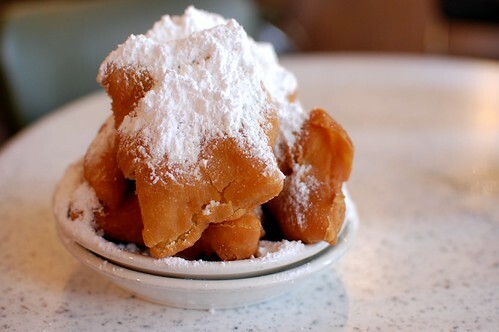 I've heard those beignets are little pieces of heaven. That little boy is adorable in all of his powdered sugar glory. I cannot believe all those people waiting in line to sit outside. I love a/c. They are never as good the next day, but I always got a box of those suckers brought home for me. And of course, there was always a box in the pantry so we could make our own. Hmmmmmm. Yum. 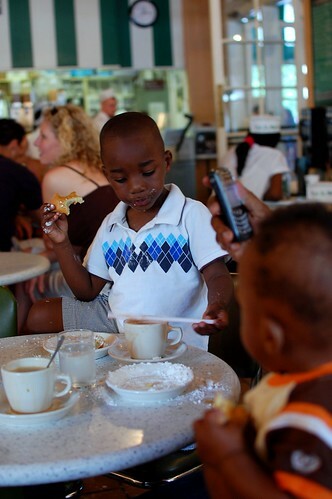 I love you, Cafe du Monde. Dumbasses is right. Aircon > humid al fresco. We took a trip to New Orleans when I was hugely pregnant and I happily stuffed myself on beignets at least once a day (and often more). Yummy! Yummy! 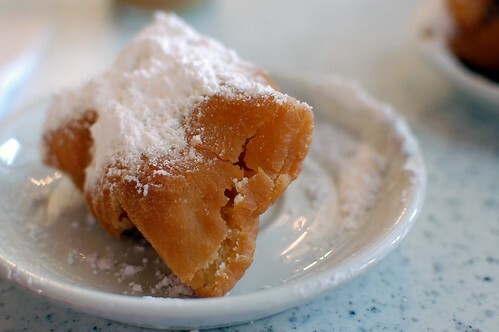 Now I'm craving a beignet. Or two. 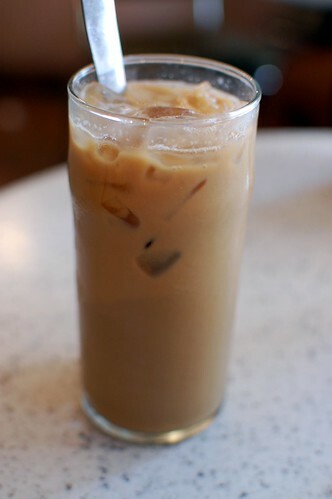 i've had someone make it from the mix they sell at the cafe for me, but never had them AT the cafe. yum. love the powder sugar-covered boy. cute. I was randomly told about Cafe Du Monde the day before we left for NO. Sooo glad we went. Those beignets are heavenly! 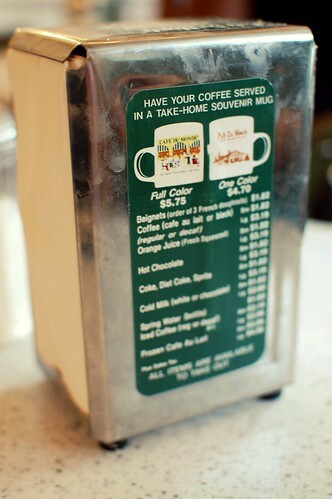 I Love New Orleans, and could never go without going to Cafe Du Monde. Yummy! Awesome photos. I need to get back to NOLA with a digital camera! You are a first class hobag for torturing me so. 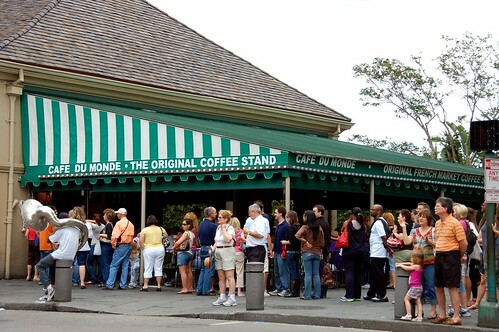 In the many times I've been to NOLA, I've never seen a line like that for Cafe Du Monde. We have a CDM in the mall here in Baton Rouge, but it's just not the same. for years i've been declining invitations from friends to go to new orleans. i know i'd come back 800 lbs from all the booze and beignYAYs. ashley-cita: We got there around 11. LMAO @ the folks who waited to eat outdoors! Beignets are delicious though I've never had them straight from the source. I'm a drooling, jealous woman right now. Oh, and nice photos. Lookin' sharp! like rachael, the closest i've ever gotten is the tasty treats at disneyland. and those are already yummy, so i can only imagine how much i'd love the real thing. looooove powdered sugar on anything and everything. That little boy is so cute! Those look amazing. I've only had beignets at Grand Lux Cafe - Cheesecake Factory's evil twin. 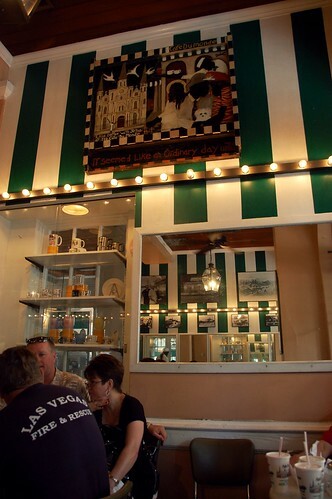 Nothing like beignets from Cafe du Monde. Saw the comment about imitation Disney beignets and may need to wander over to Downtown Disney tonight to entertain myself between meetings with some faux-beignets. 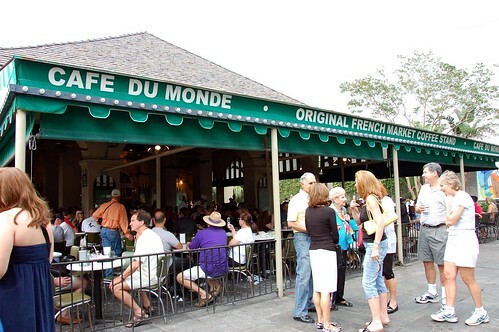 You know what I love about Cafe Du Monde??? They run the place like a freegin' pho joint. I miss N'awlins. I'm loving your photo posts! Holy Moly that looks good!!! Powdery, sweet, goodness! !